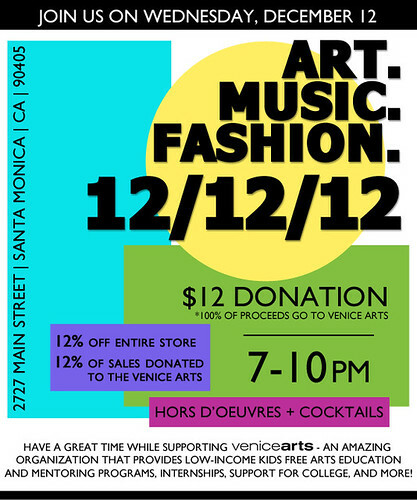 Venice Arts Fundraiser at Hip'tique: 12-12-12 - Yo! Venice! Hip’tique at 2727 Main Street in Santa Monica will host a fundraiser for Venice Arts tomorrow evening from 7-10pm! There is a suggested donation of $12 at the door, but 100% of that will go to Venice Arts! All items in the store will be 12% off, with 12% of sales donated to Venice Arts too! DJ Big Drop will be playing and there will be a whole lot of KAH Tequila being served! Click here to find out more on Facebook!